Whether you prefer Willy Wonka and the Chocolate Factory (1971), Charlie and the Chocolate Factory (2005), or Roald Dahl’s classic novel, you’re certainly familiar with the iconic blueberry scene. I’ll admit it – as a child, the scene was a little intense. 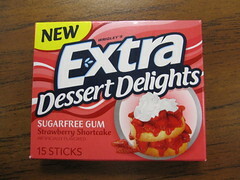 The thought of an all gum dessert seemed very futuristic when I was younger, but with the advances in food science, it seems like Extra has just about taken us there. The new Dessert Delights line of gum definitely reminds me of Willy Wonka, with flavors like Mint Chocolate Chip (review soon) and the flavor reviewed here: Strawberry Shortcake. The scent was typical of strawberry gum, floral, and slightly artificial. The first bite was very juicy and reminded me of how Strawberry Shortcake (the doll) smelled. Then, as the flavor developed, I tasted touches of cream. Here's the Willy Wonka part: maybe it was my imagination, but I swear I could taste angel food cake flavor in there, too. Unfortunately, the flavor weakened dramatically after just a minute or so, but the angel food cake flavor hung around longer. The gum also got a little hard at this point seemed to make my jaw tired after about five minutes. 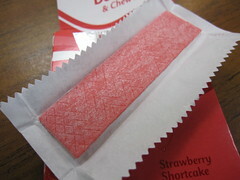 Still, the flavor was complex and the experience of chewing a dessert gum was pretty cool. Thankfully, I haven't shown any signs of turning into a strawberry...yet. Check out another review at Gum Alert. The gum looks good though, looking forward to the next review. Pity there's no blueberry, I love blueberry gum. I saw these mentioned somewhere on the web this week. i tried to grab some free samples, but I guess that offer is expired. Sad face. Willy Wonka was the first thing I thought of too! I'll have to pick some of these up. Kelly - Angel Food cake is kind of like a sponge cake, but it's got almost a meringue-like flavor. I didn't know that it was an American cake until now! Foodjunk - I didn't know there were free samples! Apparently, there is also a Key Lime Pie flavor, but it wasn't at my supermarket.